Southern Italy Small Group Tour with Amber Road » Our 17th year! 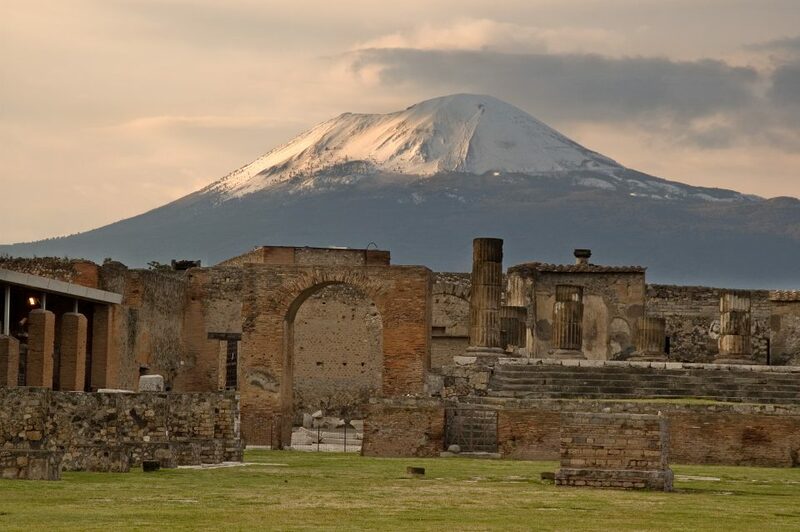 Southern Italy Small Group Tour Overview: Our Amalfi Coast to Apulia tour begins with a visit to incredible Pompeii. 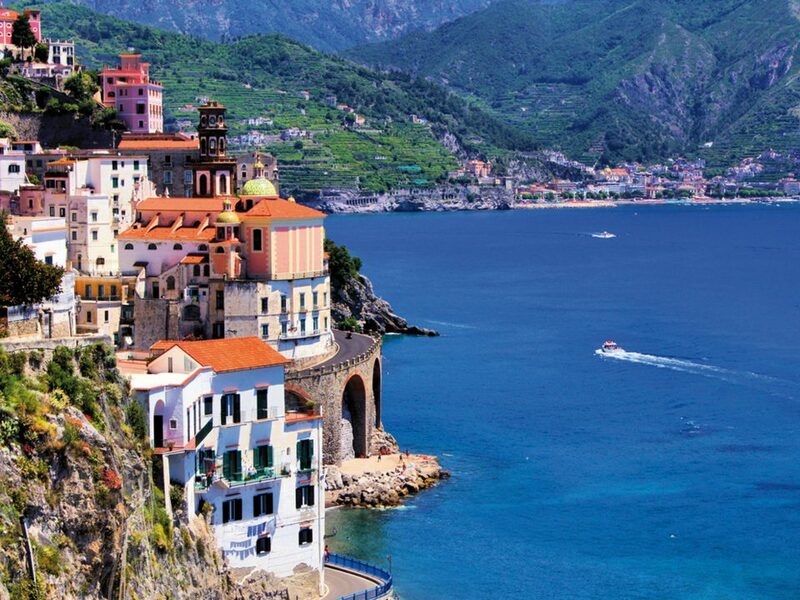 Then we’ll spend four nights on the unforgettable Amalfi Coast. Ravello is home to fabulous gardens, spectacular views and world-renowned classical music concerts. A boat cruise will take us to picturesque Positano and we’ll visit the maritime museum at ancient Amalfi. 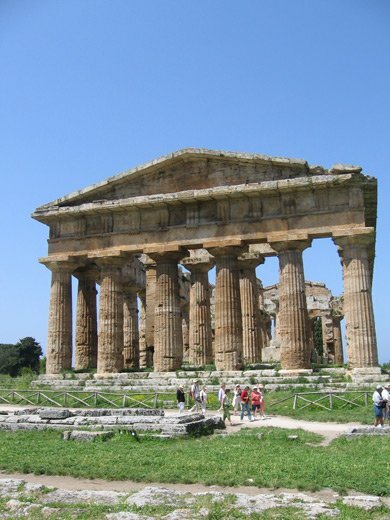 Italy’s most impressive Greek Temples are at Paestum. 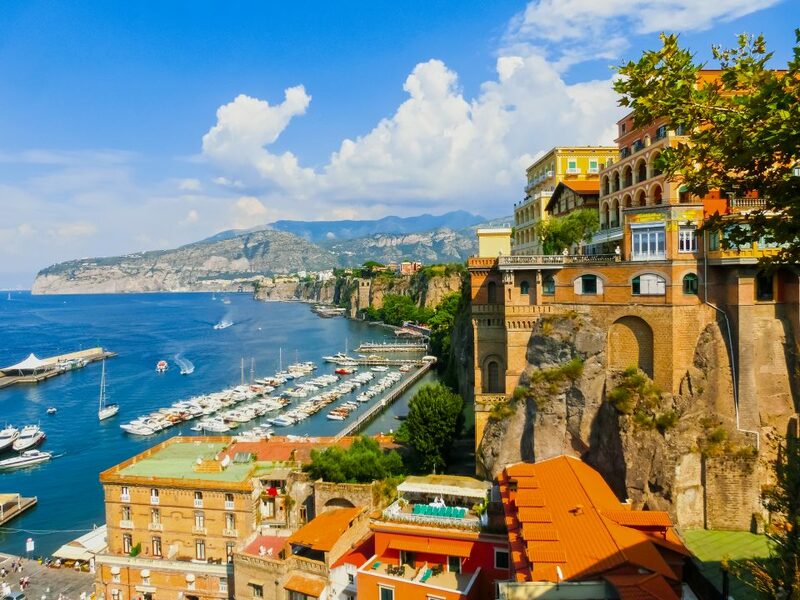 We’ll have a taste of limoncello at Sorrento and experience the famous Amalfi Coast drive. Apulia, also called Puglia, is the less traveled and many treasured heel of the Italian boot. 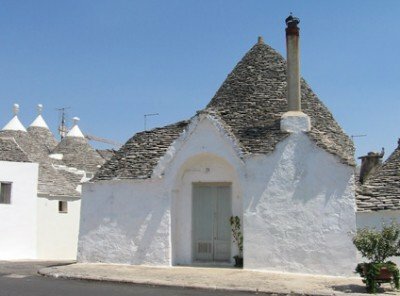 This region hosts mysterious castles and cone-shaped Trulli homes while providing the country’s best food and excellent Primitivo wine. Our historic district lodgings are in the capital port city of Bari, Baroque Lecce and the white city Ostuni. The region of Basilicata offers the absolutely unique experience of the gorge and cave dwellings at Matera. Late morning transfers from Naples train station and airport, where you will be met by your tour manager. Our first stop is for a fascinating afternoon guided tour through the streets of Pompeii, the ancient Roman city that remained buried for 1800 years underneath ash and stone from the eruption of Mt Vesuvius in 79 A.D.
Ravello, once home to ancient Roman villas, was later the second city of the powerful Amalfi maritime republic with a population of 40,000. 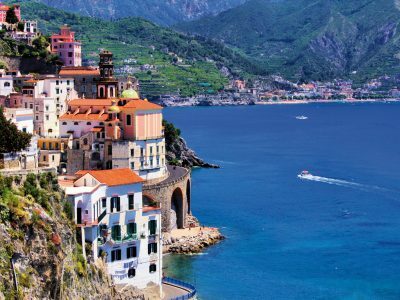 Spectacular views, wonderful semitropical gardens, a grand open square and 11th century cathedral highlight this small piece of Italian paradise. In more recent centuries Ravello has played host to many famous composers and writers like Richard Wagner, D.H. Lawrence, Virginia Woolf and Gore Vidal. Our four night stay at the elegant Hotel Villa Maria will begin with aperitifs and welcome dinner on the hotel balcony overlooking the stunning Amalfi Coast. Morning at leisure. Ravello, a noted resort during ancient Roman times and later part of the Amalfi Republic, has in the last few centuries been home to famous writers and composers. It has much to enjoy with its sea views, wonderful gardens, pedestrian only lanes and enormous town square. 2pm departure for a boat cruise to colorful Positano, dramatically perched on a cliffside overlooking a deep blue sea. Late afternoon return to Amalfi, the most intriguing city of this whole amazing coastline. The Amalfi city-state, unlike the rest of Italy (Venice excluded), didn’t disappear into the so-called Dark Ages, but maintained a continuity of wealth and influence from Roman times until the 11th and 12th centuries when it suffered sackings first by Normans, then twice by Pisa. Its decline was completed in the 14th century, when an earthquake caused most of the city to slide into the sea. Today it is a beautiful small town that hugs the harbor with winding pedestrian lanes and 5,000 inhabitants. Our guided tour will take us through the tiny squares and alleyways, the Arsenal (medieval shipyard) and the Norman cathedral. Included seafood dinner at a local trattoria. 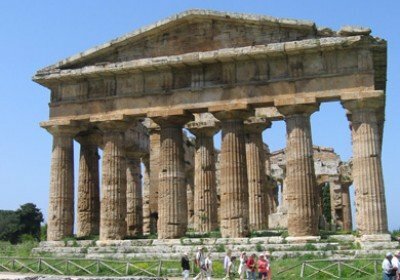 Paestum, an ancient Greek and Roman town founded in 720 B.C., is home to three of the best preserved Greek temples in the Mediterranean. Paestum was abandoned during medieval times and its existence forgotten until the 18th century. Our local guide will walk us through the archeological complex and museum bringing this powerful town of Magna Graecia back to life. Late afternoon and evening free in Ravello. Sorrento, our morning destination, sits atop a cliff looking down on the Bay of Naples. Narrow, winding lanes, artisan shops, wisteria hanging from terraces and the smell of citrus flowers all add to the charm of this historic resort town. Mid afternoon we’ll take the famous Amalfi Coast scenic drive back to Ravello. Evening free. 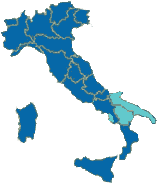 Leaving the Tyrrhenian coast we will cross the Italian peninsula to the Adriatic Sea. Our first stop is at a trattoria where we will experience the unique local cuisine and wines. Afternoon guided visit to Castel del Monte, the enigmatic octagonal castle erected by the Holy Roman Emperor Frederick II in the 13th century. Transfer to Bari, the capital city of Puglia, where we’ll be staying at the elegant Hotel Oriente, located in the Murattiano historic district. Bari Vecchia, the fascinating old town, with its clustered homes and narrow winding lanes, lies on a peninsula extending out to the two Adriatic Sea ports. The modern part of the city, laid out in a grid pattern during Napoleonic times, features the city’s major shopping area and a long seaside promenade, the lungomare, where fishermen sell their catches right off their boats. Your guided city walking tour will also include the 11th century cathedral that contains the remains of Saint Nicholas. Late morning free for your own explorations. Afternoon visit to the Pinacoteca Giaquinto Museum of Art followed by free time to explore the Murat District, the “new town” built in 1813 during the French occupation. Included dinner at one of Bari’s best restaurants. Morning visit to Trani, a beautiful port town that was once the possession of Venice. 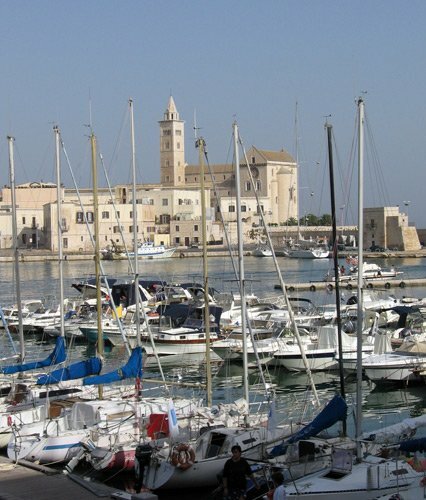 Trani’s origins date back to early Roman imperial days. Its historical notes begin in the 9th century, during the time of the Lombard and Byzantine dominations. In later centuries it was under the rule of Normans, Germans and Aragonese. 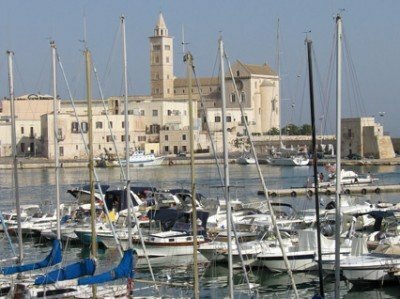 Today, Trani is a prosperous fishing town with a lovely port and beautiful pedestrian only piazza. 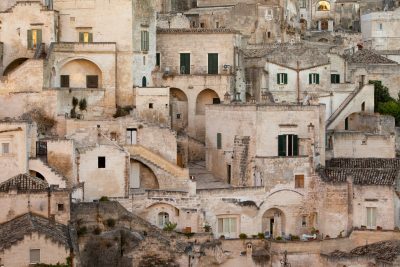 Afternoon transfer to the “Sassi” of Matera, a spectacular agglomeration of cave dwellings built into the soft tufa stone of deep ravines. Our hotel for the next two nights is the Locanda di San Martino or the Hotel Palazzo Viceconte, both located in the heart of the Sassi historic district. Inhabited since prehistoric times, there were 18,000 resident Sassi cave dwellers as recently as the 1950s when they were forcibly evacuated for inadequate sanitation. Now a UNESCO World Heritage Site, the area has been repopulated, the homes renovated, many transformed into elegant hotels and restaurants. This morning we will have a fascinating guided tour through these antique lanes including a visit to the Peasant Culture Museum. On the plateau above the gorge, just 100 meters from your hotel, the more modern Matera offers an architectural gem of a city center with open squares, fountains and inviting shops. Today our first stop is Manduria, where we’ll visit a local winery for a tasting of their excellent “primitivo” wines and a visit to their Wine Culture Museum. Included light lunch. Afternoon transfer to the historic district of Lecce, where we’ll be staying at the 18th century Patria Palace Hotel for two nights. 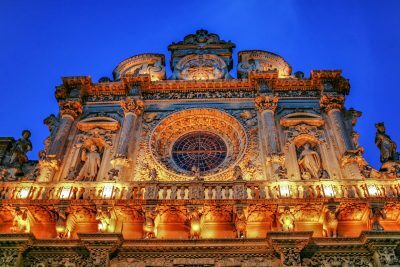 Lecce presents an architectural feast. 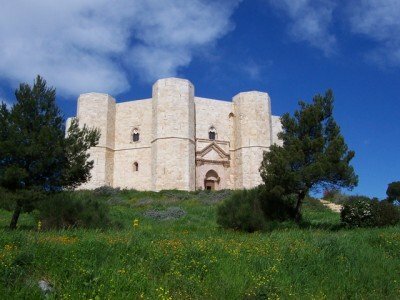 An ancient settlement of the Messapii tribes, it is the principal Baroque city of Puglia. 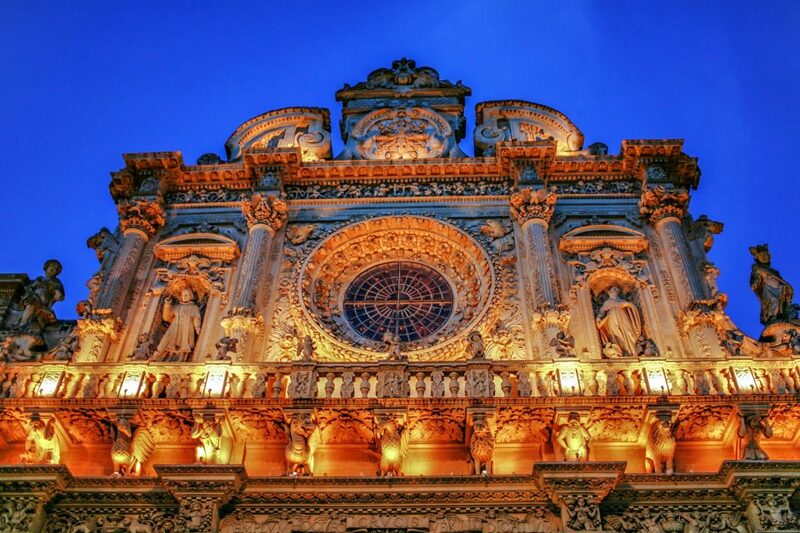 Baroque, in architecture, is a theatrical style begun in late 16th century Italy as a statement of the power of the Catholic Church in response to the Protestant Reformation. Morning local guide tour of Lecce. Afternoon trip to the ancient Roman and Byzantine town of Otranto, the easternmost point on the Italian peninsula. 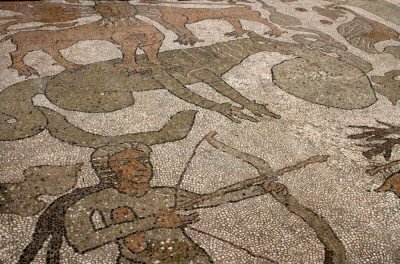 Our guide will take us through the 1000 year old walled hamlet and the 11th century Norman cathedral with the best preserved mosaic floors in southern Italy. Morning visit to the medieval town of Galatina to see the 14th century Santa Caterina d’Alessandria Cathedral where there are frescoes so vast and magnificent that you might imagine yourself to be in Assisi. Our next destination is Brindisi, the famous Adriatic Sea port of the ancient Romans and the terminal point of the Appian Way. Included lunch. 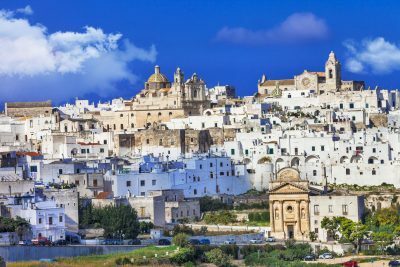 Ostuni, one of the most beautiful hill towns in Puglia, is white, all of it – the houses, shops, churches, streets – set under a deep blue sky and perched on a hill overlooking the Adriatic Sea. The upper historic center is a maze of twisted lanes and staircases, homes constructed one on top of another, and arches that seem to hold it all together before spilling out into an enormous square full of bars, shops and restaurants that is the lower town. 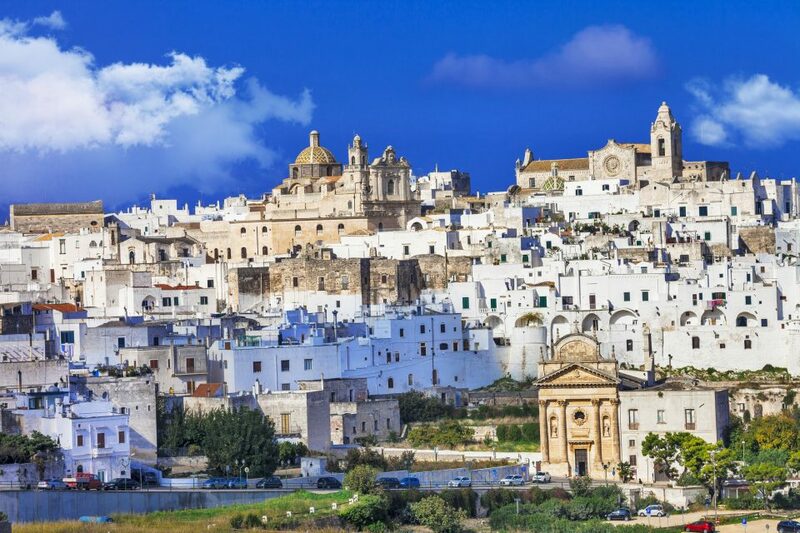 Inhabited at least since 1000 BC by native peoples, Ostuni was destroyed by Hannibal during the Punic wars, rebuilt by the Greeks, taken over by Romans, sacked by Gauls and revived during medieval times. Our hotel is the labyrinthine 13th century Hotel La Terra. Our guided tour of the city will be followed by a tasting of local products. You’ll have the evening on your own to further experience the wonderful local cuisine. 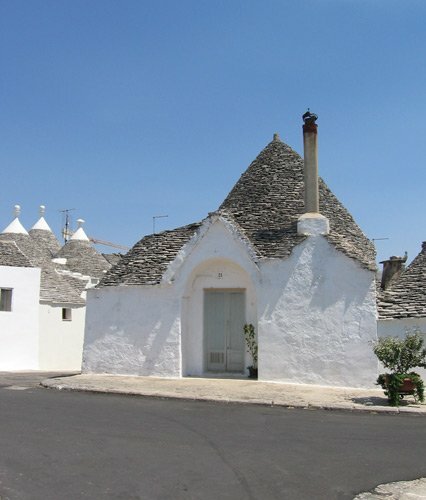 At Alberobello there is a village of one thousand fairytale-like Trulli, round white houses with tall conical roofs. Our local guide will explain their mysterious origins and why people continue to build them. Afternoon tour of an 11th century Masseria (fortified farmhouse) with a tasting of olive oils from their ancient olive trees. Farewell dinner of local Apulian delicacies and last limoncello in Ostuni. Morning transfers to Brindisi airport and train station. Morning transfers at scheduled times from Ostuni to Brindisi airport and train station. How to get there: Book a multicity ticket into Rome or Naples and out from Brindisi. Travelers arriving from Rome can take the high-speed Eurostar train departing Termini station at 09:20, arriving Naples at 10:32. Pre tour: We recommend arriving a day or more prior to tour start. You will be met by our driver at the airport and transferred to your city center hotel. Be prepared to spend a few hours a day on your feet and for uphill walks to some hotels, steps and inclines in Ravello, Matera and Ostuni. The Hotel Villa Maria at Ravello is a 5 to 10 minute walk up a moderate incline with steps from the town square. This tour is not suited for anyone who has problems with knees, back, heart, obesity or those who cannot manage steps and moderate inclines. Age is not important as long as you are reasonably fit and a good walker. If you have mobility issues this is not the right tour for you. Please call us if you have questions. Prices shown are per person, double occupancy, in euro. The deposit is 400 euro per person. Balance payments are due 70 days prior to tour start. Deposits and balance payments are accepted by Visa and Master Card or by bank wire. After your deposit has been accredited we will send you an invoice with the due date and amount for the balance of payment. Should you fail to make final payment by the date specified on your invoice, we reserve the right to cancel your booking without refund. Cancellations and refunds: in the unlikely event that we would cancel your tour, you would be entitled to a 100% refund within 2 weeks after the tour’s cancellation. are 50% refundable up until 180 days prior to tour start date. are 100 % non-refundable less than 180 days prior to tour start date. are 98% refundable 70 days or more prior to tour start date. are 48% refundable 70 to 31 days prior to tour start date. 30 days or less prior to tour start date: no refund. We strongly recommend that you purchase a travel protection plan to help protect you and your travel investment against the unexpected. Travel protection plans can include coverage for Trip Cancellation, Trip Interruption, Emergency Medical and Emergency Evacuation/Repatriation, Trip Delay, Baggage Delay and more. For more information on the available plans or to enroll, go to www.travelexinsurance.com or contact Travelex Insurance Services at 800-228-9792 and reference location number 40-0072. It is not possible for Amber Road Tours, Inc. to provide protection coverage of any sort and you agree to buy insurance or travel at your own risk. Transfers from Naples train station and airport on Day 1 (available only at scheduled time). All ground transportation Days 2 to 12, including tour manager and drivers. Transfers on Day 13 from Ostuni to Brindisi airport. 12 nights’ hotel accommodations with breakfast. Included meals listed on itinerary including beverages (wine or beer or soft drinks and water). Admissions to all sites visited as a group, as listed in the highlights of the tour itinerary. Air transportation, all meals not listed above, room service, phone calls, etc. Naples has a modern, clean and uncrowded train station. Your meeting point is the pharmacy inside the station – your tour manager will be waiting for you there for the 11:30 transfer. (If you are coming by train from Rome there is a high speed Eurostar train departing Termini station at 09:20, arriving in Naples at 10:32) There is also a transfer from Naples airport at 12:15. 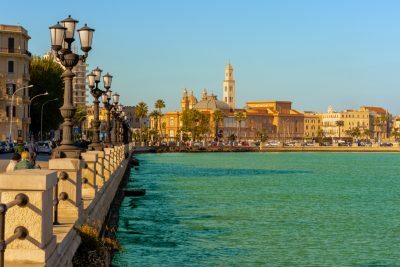 Brindisi has a beautiful, well-organized, small airport offering eight flights a day to Rome and others to Milan, Venice, Verona, Paris, London and Zurich. It also has a port with departures for Greece, a train station and car rental services. Our last hotel destination in Ostuni is 30 minutes from the airport. Morning transfers to Brindisi will be made to accommodate all departure needs. You are allowed one suitcase and one carry-on bag. If you exceed this limit there may not be space in the coach to transport your excess luggage and it will be at your own expense to have it transported throughout the tour. We suggest that you bring a daypack for carrying water, guide books, jacket, rain gear, etc. Be prepared to spend a few hours a day on your feet and for uphill walks to some hotels. This tour is not suited for anyone who has problems with knees, back, heart, obesity or those who cannot manage steps and moderate inclines. Age is not important as long as you are reasonably fit and a good walker. If you have any difficulty walking this is not the right tour for you. Are located in quiet locations within historic districts or a short distance outside the city walls. European hotel rooms are generally smaller than those in the U.S., and have one queen bed or two single beds, with private bath. We have space available for one or two singles on each of our tours. They are provided with single-use double rooms. The additional single supplement cost is 700 euros. Please contact us for availability prior to booking. For our recommended tours and dates, as listed in our web site, are guaranteed. We do not sell optional excursions or take you on shopping expeditions. Your additional expenses will be for non-included meals, moderate tipping where appropriate, and personal sightseeing or shopping. We have a no smoking policy on all tour buses, at group meals and at all sites visited. The same policy applies to the use of cellular phones. Amber Road Tours reserves the right to accept, reject, or not retain any person as a tour participant whose condition or general deportment impedes the operation of the tour or, in the opinion of the tour manager, affects the rights and enjoyment of other guests. A guest not retained on tour shall have no cause for complaint or refund, and shall bear any and all extra expenses that ensue.